Donald Trump’s surprise victory leaves companies across the economic spectrum, from Amazon and Boeing to Microsoft and Starbucks, assessing what to expect from four years under the unorthodox businessman and his shifting policy pronouncements. The U.S. aerospace industry awoke Wednesday to find the business prospects of the defense and commercial-airplane sectors scrambledby a President-elect Trump. On the defense side, industry analyst Loren Thompson of the Lexington Institute declared in a piece for Forbes, “Trump’s win means happy days are here again.” Trump’s broad plans to spend more on weapons systems, slash the corporate income-tax rate and bolster U.S. manufacturing all bode well for defense contractors, including Boeing, he wrote. In contrast, the commercial-airplane side of Boeing’s business depends critically on overseas sales and on an international order geared toward free trade. Trump’s anti-trade and protectionist rhetoric during the election campaign has raised concern that the new administration’s policies might stall the expansion of the global airline industry. Trump specifically railed during the campaign against the Obama administration’s deal with Iran, which opened the way for a major widebody-jet order expected by Boeing, and against the Export-Import Bank, which supports the financing of many overseas commercial-airplane sales. And Trump reserved much of his fiercest criticism for trade with China, which buys one-third of all the single-aisle 737s Boeing builds in Renton, in addition to a growing number of widebody jets. 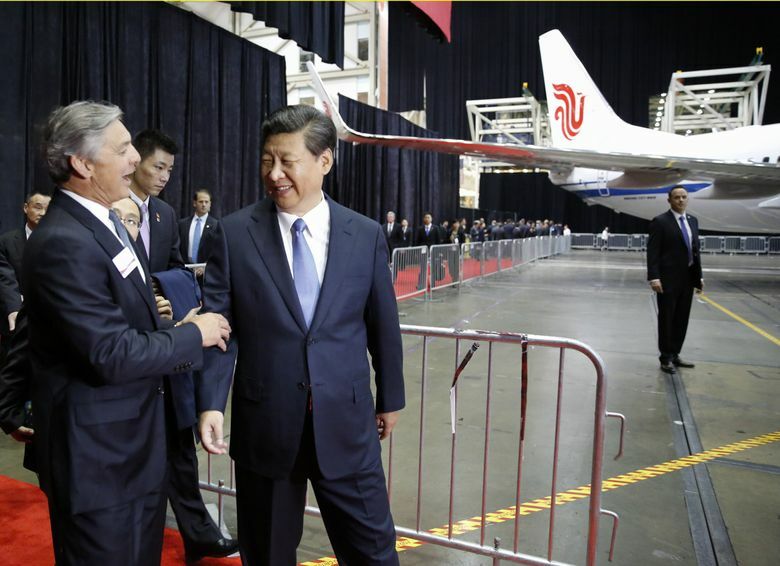 He even warned in darkly hyperbolic terms that unless he were elected, Boeing would be making all its planes in China within five years. The morning after the election, though, aerospace- industry leaders strove hard to be positive about the risk to future trade. “We’ll try to work with (Trump’s) team to convince him that having trade opportunities is an essential for our American industries, like the commercial-aircraft industry,” said Dave Melcher, chief executive of the Aerospace Industries Association lobbying group, which represents the biggest U.S. aerospace manufacturers and defense companies, as well as their suppliers. Melcher said that in a June meeting with other industry groups at Trump Tower, the aerospace contingent had the floor for about 40 minutes. He found Trump to be “an interested, smart businessman who asked good questions,” he said. Melcher said he specifically argued that to support U.S. manufacturing, Trump needed to back the Ex-Im Bank, which currently is not authorized by Congress to do any deals worth more than $10 million. More generally, although he’s concerned about all the anti-trade rhetoric — “a lot of that was campaigning” — he believes the industry will be able to work with Trump. “I really don’t see him as blasting and rebuilding a system that works,” said Melcher. Many of Trump’s statements portend a more confrontational foreign policy, which could have impacts on the commercial-airline industry. For example, Trump has attacked the Obama administration’s “normalization” of U.S. ties to Cuba and threatened to reverse it. Alaska Airlines is among the carriers slated to begin flights to Havana. Are those flights starting in January now effectively dead? Alaska and the other airlines must wait and see. A4A Chief Executive Nicholas Calio emphasized the need to spend some of that on strengthening the nation’s overburdened air traffic control system. “We look forward to working with the Transition Team on strengthening our infrastructure in the sky,” Calio said in a statement. Donald Trump seems to have no love for Amazon.com’s CEO Jeff Bezos, who also owns The Washington Post, a newspaper that aggressively investigated the candidate during the no-holds-barred campaign. So what are the prospects for America’s fifth-largest company by market value under an administration led by the Republican firebrand? Bezos built an empire based, in part, on internet sales of goods made by the overseas factories Trump has said have stolen American jobs. Free trade is crucial to its worldwide network of warehouses, transportation systems and profitable data centers that are turning Amazon into a truly global store. At the end of 2015, more than a third of its physical footprint was in countries other than the U.S., and about 32 percent of its retail sales occurred overseas. Investors seemed to sniff some danger: Amazon shares fell $15.87, or 2 percent, to $771.88 Wednesday, even as the wider stock market shrugged off initial fears about a Trump presidency. Colin Sebastian, an analyst with Baird, said it’s unlikely a U.S. administration could build an antitrust case against Amazon, which remains small in terms of global retail. “They’re not a majority player,” he said. As for the potential impacts of higher tariffs, “that would affect a lot of companies,” including major competitors that offer less selection than Amazon, and are therefore more vulnerable, Sebastian said. As the dust settles over the idea of a Trump victory, other retailers are certainly looking at the oncoming administration’s stance on trade. Suresh Kotha, a professor of management at the University of Washington’s Foster School of Business, says modifying those trade pacts could take years. “It’s easy to make a threat; it’s very hard to govern,” Kotha said. Trump’s hard line on immigration is at odds with the position of Microsoft and many of the company’s technology peers. Brad Smith, Microsoft’s president and the leader of the company’s legal and lobbying organization, has campaigned for an increase in the number of skilled workers Microsoft can bring in to the country. Like many tech firms, Microsoft has come to rely on guest workers who come to the U.S. under the H-1B visa program. During his campaign, Trump said he opposed the program, though his statements on the matter have also been contradictory. He, at times, indicated support for the visas, suggesting raising wages for visa holders and smoothing their path to receiving permanent residency. The generally protectionist tone of Trump’s outlook on trade could also concern Microsoft, whose employees and products span the globe. At an event in September in Vancouver, B.C., Microsoft co-founder and board member Bill Gates said the company was structured on the assumption that people, products and ideas could compete in an open global marketplace. Though he didn’t mention Trump by name, Gates said the rebuke to a more interconnected world dealt by the Brexit vote and “some other things” was worrying. “Microsoft and my foundation are really predicated on a huge amount of cooperation between all the different countries in the world,” Gates said. A Trump administration could be good for Microsoft’s pocketbook, however. His tax plan would lower the corporate income-tax rate to 15 percent, from 35 percent today. Trump has also proposed taxing foreign profits repatriated to the U.S. at a 10 percent rate. Microsoft, which has structured its global operations to avoid U.S. taxes, at the end of June had more than $124 billion in income, untaxed in the U.S., held overseas. The company’s tax bill at the current rate were it to repatriate that sum would be $39 billion, the company says. Other tech giants such as Apple, Google, and Oracle also have large sums sitting overseas not subject to U.S. taxes. Starbucks has huge ambitions in China, where the coffee giant plans to double the number of its stores to 5,000 by 2021. Trump has proposed high tariffs for imports from China, as well on U.S. companies that shift manufacturing to foreign countries. If his administration moves forward on those plans, and a trade war with China results, it could have far-reaching consequences for Starbucks and many other companies. Starbucks declined to comment on that Wednesday, but it did issue a letter to U.S. employees from Chairman and CEO Howard Schultz, who said he was “stunned” by the result of the election. Schultz publicly endorsed Clinton in September. “We cannot know what the precise impact will be on our country and the rest of the world,” Schultz wrote. “ I am hopeful that we will overcome the vitriol and division of this unprecedented election season. “Countries will look out for their own interests. This will result in a patchwork of trade barriers, and that’s difficult for businesses. For every market they sell into, there will be different rules,” she said. “There’s going to be a reallocation of jobs across industries if we move back to a more protectionist international system,” she said. One immediate impact of Trump’s election may be a hesitation by companies and investors to make big decisions until it’s clear what policies he will implement, said Michael Schutzler, CEO of the Washington Technology Industry Association. Seattle Times business reporters Dominic Gates, Matt Day, Ángel González, Janet Tu and Rachel Lerman contributed to this story.